Maxim Leo wonders ‘How I Became a Westerner’. He didn’t know how it happened and couldn’t quite believe it. Born in what we used to call East Germany, he now has a French wife, two children who don’t even know that there was ever a Wall in Berlin, and he rejoices in the knowledge that as long as he lives he need never think about politics again. However, although his life has become totally different since his own childhood, there is always the underlying awareness that, ‘the East isn’t far away at all. It clings to me, it goes with me everywhere. It’s like a big family that you can’t shake off.’ So he wrote this family memoir in an attempt to make sense of his own story and, perhaps, though he doesn’t say so, to be able to put it out of his mind. Leo’s parents, Anna and Wolf, may have looked nonconformist in their hippy gear – hair dyed green or blue, leather jackets they had painted themselves – but that was the extent of their rebellion. They adopted the ideology, adapted it to suit their own tastes, and got away with it – unlike so many others – but much later they recalled that, ‘the GDR was always there in bed with us.’ An artist and a journalist, protected by Gerhard’s connections, they were able to give Maxim a pampered childhood, shielding him from reality. It was not until he left school that he understood how little his parents’ world had to do with everything else that was happening in the country and not until working on this book that he realized what complicated compromises his once idealistic parents had to make. Anna and Wolf managed to remain loyal to their dream of a democratic republic long after their country had become an undemocratic tyranny. Maxim’s affectionate, insightful account makes one understand how that was possible, and how the fantasy of building an anti-fascist state was so powerful that the GDR survived for four decades. The book reaches its climax is as the Berlin Wall comes down and Maxim walks through Checkpoint Charlie, unquestioned. 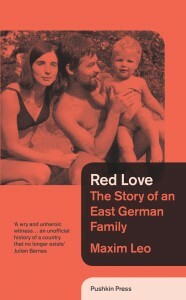 Red Love is a fascinating tale, especially for anyone old enough to remember the days of the GDR and the Berlin Wall. It is beautifully written and translated, the author comes over as modest, wry and perceptive, and this memoir won him The European Book Prize.